1987 saw the release of the game Street Fighter and since then, it has enjoyed rising popularity with playable characters originating from all over the world, and each one representing a different fighting style. Over the years, it has evolved, and Street Fighter 2 made a debut as a slot machine. The tradition continues with Street Fighter IV from Cyrptlogic, the very same company that adapted Street Fighter II. Cryptlogic has taken great care with the franchise, ensuring that this adaptation encompasses the quality and simplicity of the original. The game features five reels and twenty-five pay lines, honoring the series with several icons and graphics from the original arcade game. Additionally, with high-end software from Cryptlogic, the game runs smoothly and bug free, as is to be expected. Players from all walks of life will find the game to be pleasing in terms of both aesthetics and of course, financially. By this we mean that the minimum bet is just $0.01, though those who want to put a little more skin in the game will be able to bet up to $500 per spin. The maximum bet rests at just 25 coins, however. There are many unique symbols that complement the theme of the game, from the Yin Yang wild icon, to the Street Fighter IV logo scatter. In addition, there are several interesting animations that, while not adding value in terms of jackpot or play, make the game far more interesting to look at. 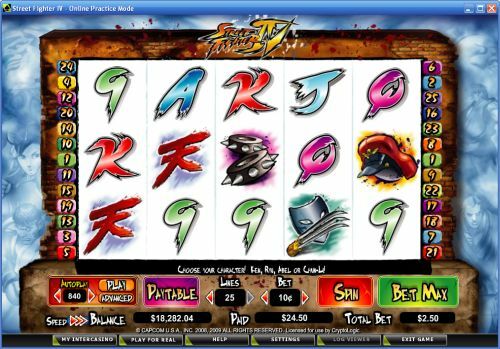 Starting the game, the player will not only choose their bet, but also their fighter character. Just as with the arcade game, there is a wide variety of different choices, ensuring you have a complete street fighter experience. If you have played the Street Fighter arcade game, then the inclusion of so many characters will mean even more to you. Finally we come to the issue of the wild symbol, which as we mentioned before, in the Yin Yang. The symbol appears only on Reels two and four, and can replace other symbols in the interest of creating winning combinations. Keep in mind that it CANNOT replace the Street Fighter IV logo scatter symbol. When a player manages to get five hat icons to display on a pay line, they will receive the maximum prize jackpot, which happens to be 5000 coins. Those who bet the minimum can only expect to win $50 when hitting this jackpot, but those who dare to play the maximum wager will stand to win up to $100,000, which certainly gives you an incentive to go above and beyond. There is plenty to like here whether you are a fan of the original arcade game or simply a slot player looking for the next big jackpot. Give it a try; Cryptlogic never disappoints! It does have a number of shortcomings, but with a good bonus game and a strong representation of the original console based fighting game, you will find that you not only have fun, you will come back again and again to take your fight to the streets.